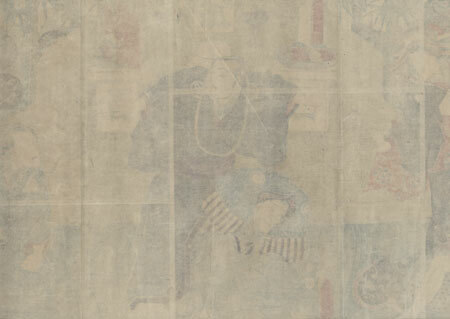 Comments - Intriguing kabuki scene of a confrontation taking place in front of a home altar. 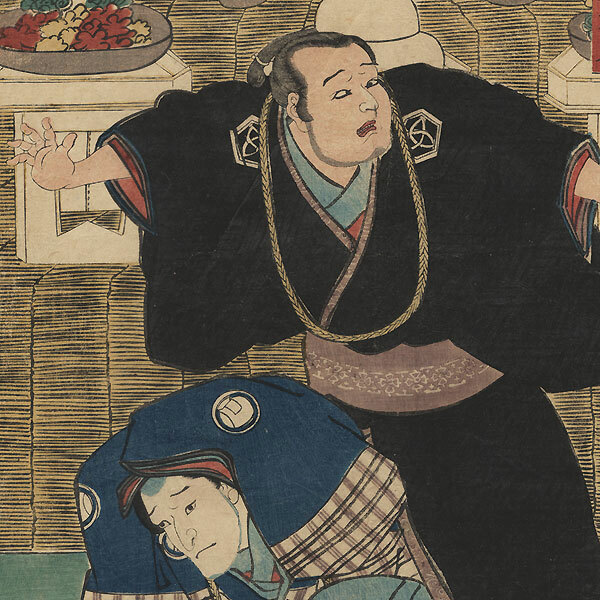 In the center, a man cowers on the floor, hiding beneath his sleeves as the man standing behind him throws his hands out in alarm. The kneeling samurai at right looks up at him with a questioning expression, a stack of money wrapped in paper in his outstretched hand. The fellow at lower left scratches his head in a puzzled manner, while the beauty smiles. Behind them a large tiered altar is covered with straw matting. Offering trays holding food are neatly arranged on the lower shelf with oil lamps above and a sacred shimenawa rope hanging from the ceiling. Nice expressive figures in an interesting setting, with a burnished geometric pattern on the black kimono. Image Size - 13 5/8" x 28 7/8"
Condition - This print with excellent detail as shown. Three attached panels, backed with paper. Diagonal fold. Small loss, a few small holes, repaired. Slight toning and soiling, a few creases and small spots. Please see photos for details. Good overall.